Pancakes are multi racial and international. Every country has their own different pancake recipes. I have posted quite a few Chinese style pancakes. Now lets return to a traditional Malay recipe. 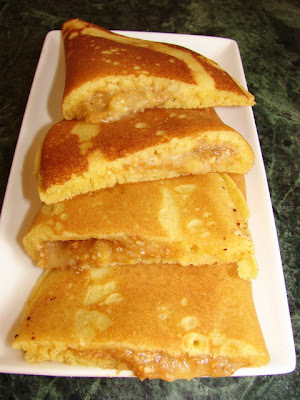 This pancake is Apam Balik, translated as turnover pancake. There is a thin and crispy version and a thick and fluffy one like this post. 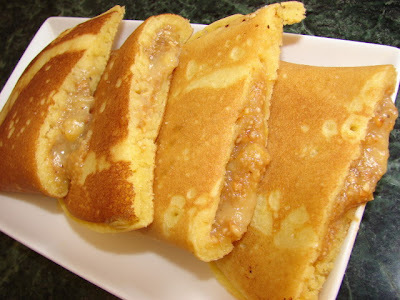 This thick pancake is similar to American thick pancake with a sweet filling. Traditional filling is peanut with some cream style corn. This recipe makes about 6 pancakes. Mix the batter dry ingredients together then add in beaten egg, milk and butter/oil, mix till no lumps. Ground the peanut using a food processor with sugar. Use a good non stick frying pan. Heat the pan without any oil till quite hot, pour in some batter about 3mm thick evenly. Let the mixture bubble without touching. When the pancake is almost dry on top and crispy brown on the bottom, sprinkle on some peanut mixture and about 2 - 3 tsp of cream style corn. Fold over. For an alternative filling try a few sliced banana and some finely chopped milk chocolate or some chocolate sauce. This looks mouth-wateringly tasty,Sunflower! Will have to try it some time!